In the late 80's, a food company called Nagatanien was producing "Mario Curry" for the Japanese market. The company sponsored this remake of Mario Bros. on the Famicom Disk System, and their name appears throughout. Their sponsorship also meant the price of the game was lower than other Disk System titles. This is the same as the arcade Mario Bros. The graphics from the arcade version (rather than the lower-quality Famicom version) have been reinstated, although the enemy introduction cutscenes are still missing. This is little more than a "Hard Mode". 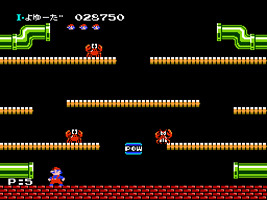 Enemies come out of pipes in huge numbers, and Fireballs seem to arrive much more quickly than in the original game. Return of Mario Bros. features a very Japanese aesthetic, with the title music and all-new cutscenes seemingly inspired by their corporate sponsor. But it wasn't only Nagatanien interested in promoting their wares: Nintendo used this game to heavily promote Super Mario Bros. 3, which was released a month earlier in Japan.